Like I said, I made it for my contribution to our Thanksgiving meal this year and it was the first thing gone! (And there weren't even that many people either :) ) Everyone there had at least seconds or thirds of this and I overheard people say things like, "Wait, what? I thought this was the dessert!" Please excuse all my Thanksgiving references in February, but my point is that people love it and gobble it up and it is a perfect side dish to make for any nice family dinner. It pairs really well with a nice ham or turkey dinner. 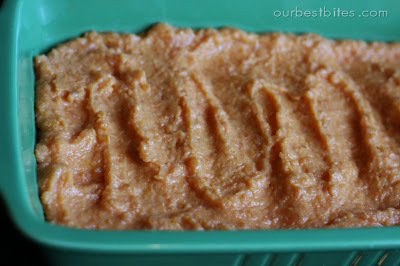 The first of two layers for this is a smooth layer of sweet potatoes, butter, sugar, sweetened condensed milk and eggs. You mix these together and put in in a greased 9x13 inch baking pan. The recipe calls for either canned or baked sweet potatoes and after reading all the comments for the recipe, people were saying they are SO much better if you go for the real, fresh stuff and bake the potatoes. I'm sure canned potatoes would be just fine if you were in a pinch though. 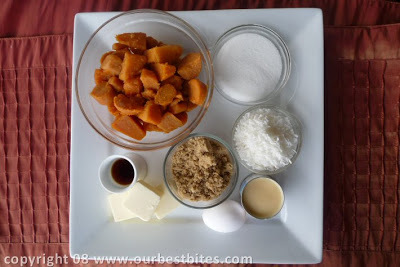 (More instructions for baking the sweet potatoes first are in the recipe at the bottom). Then comes the best part: the topping! It creates this beautiful, crispy, sweet crust on top that when combined with those smooth sweet potatoes just really puts it over the top! The ingredients for the crust are butter, shredded coconut, and brown sugar and a few people in the comments suggested adding pecans too, which I think sounds divine. I think I will try that on half of it next time to see if I like it. 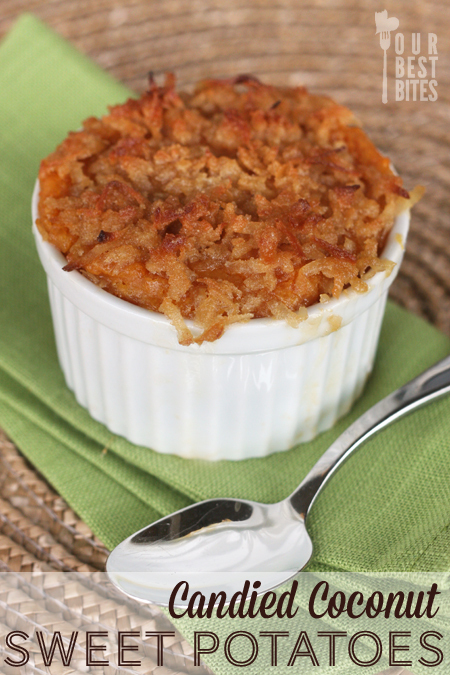 Here is a more printer friendly version of the recipe for this sweet potato casserole. I hope you love it as much as I do! Note: You can make these up to a day or two ahead of time, just keep them well covered in the fridge and don't put the topping on until just before baking. If using fresh sweet potatoes, preheat oven to 400 degrees. Prick each sweet potato with a fork and place on foil in the oven. Cook for 40-60 minutes or until tender. Once they've cooled enough to handle, slice in half and scoop out the insides into a mixing bowl. To the mixing bowl add in sugar, butter, eggs, sweetened condensed milk, and vanilla. Your butter should be soft enough to blend up easily so nuke it in the microwave before you add it to the bowl if you need to. You could mash it all up by hand, but an electric mixer works great. I don't like it completely pureed, so I mix it just until everything is incorporated but there are still some sweet potatoes in larger chunks. Spread this mixture evenly into a 9 x 13 pan. Take a pinch of the buttery-sugary mixture and put it in your mouth. Chew. Swallow. Then sprinkle the rest evenly over the sweet potatoes in the pan. Bake in a 350 degree oven for about 40-50 minutes. It will be more or less depending on the size of dish you use, whether you double the topping, etc. But the top should be nice and browned and bubbly so just keep an eye on it.